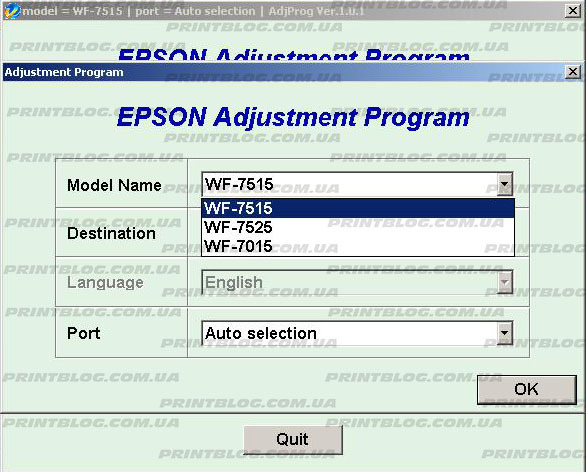 Adjustment program Epson WF-7515, WF-7015, WF-7525 - service program to reset the absorber (diapers) and perform other printer settings. Supports printers Epson, models such as: Epson WF-7515, WF-7510, WF-7015, WF-7010, WF-7525, WF-7520. Program buy it once and use an unlimited number of times. какие ограничения при использовании Adjustment program Epson WF-7515, WF-7015, WF-7525 в плане переноса на другие компы? не становится ли она резидентом на компе? нет ли в ней счетчика запусков? With this software you can check all the settings and reprogram the internal memory of your multifunction printer. I had persistent misalignment of the print head and I could solve them with this original and specific software for my device. You can also reset all the ink levels of the waste ink tank. Buy it without hesitation! It´s perfect!